The Professional Domino Association’s 2006 tournament season begins February 11th with a qualifier tournament in Los Angeles. Subsequent tournaments will be held at roughly two-week intervals, in 11 additional cities around the United States, thru the end of July. The final championship tournament, dubbed the PDA National Championships, will take place in Las Vegas on August 19th. Each qualifier tournament boasts a $30,000 prize purse, with a $150,000 grand prize total at the Championship tourney in Las Vegas. In addition to cash prizes, first place winners receive waived registration fees, free travel and hotel accommodations. There are also plans underway for a television series, and, eventually, online tournaments as well. The entry fee for each tournament is $300 ($200 for PDA members), and a $15 admission fee for non-players. There is a limit of 128 players per tournament. 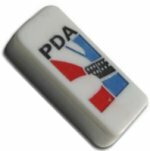 The PDA plays a version of All Fives Dominoes, with each game played to 150 points. Best 2 out of 3 takes a match in early rounds; later tournament rounds feature more games. Refer to the official tournament rules for details. If you think you’ve got what it takes to play with the big boys, check out the tournament schedule, find one near you, and enter for your chance at dominoes glory. Click here for the tournament schedule, complete rules, and registration forms. Note: This post was originally published in the Dominoes forum.